Have you ever set out to buy firewood, only to become more confused than when you started? You go to the local nursery, and they want $500 for a cord (and you’re not even sure what a cord is). Then you hit craigslist and find “cords” for $250, only to find out that it’s really a FACE cord? Kiln dried, seasoned, green, barkless, and thermawood; cords, face cords, quarter cords, and log length! It can all be a little overwhelming. I am writing this article to clear up some common misconceptions about firewood. Take the 5 minutes and read this article, then you will know everything you need to know to be an educated firewood consumer (and I can practically guarantee you won’t get ripped off!). **Please note, we don't sell all of the options described in this article!! Green - Cut and split, but this firewood that has not been seasoned or kiln dried. This type of wood is not ready to burn immediately and would result in a smoky fire, and a lot of hissing. Seasoned - Cut and split firewood that has been left out in the elements for about 9 months. Should have <20% moisture content, and the pieces should be fairly lightweight. Kiln Dried - Cut and split firewood that has been baked in a kiln to reduce moisture content. This wood is 100% bug free as the wood is brought to over 200 degrees for several days being coming to you. Usually cleaner than seasoned wood. A premium product. Debarked/Barkless - Cut and split firewood that has no bark on it. This is typically very clean wood, and it drys faster without the bark. Usually contains ash, beech, birch, and other woods with a thin bark (not usually oak). Compressed Firelog - Sawdust that is compressed into a "log" and held together with a type of resin. This is not "real firewood" per sae. Characterized by its packaging, this product can absolutely not get wet or it will fall apart. These logs give off more heat than typical firewood, but not many of the other "cozy" characteristics. Very expensive. First, let’s start with some measurements. The basic unit of measurement for firewood is the cord. Standard log length is 16”. 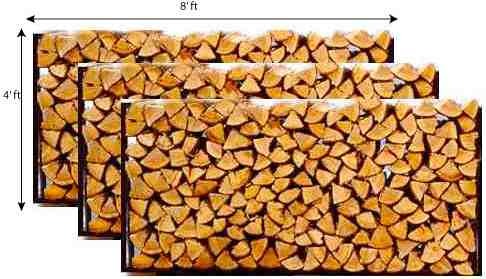 If you are buying firewood to use in your fireplace, a cord might be a little overkill. Most people who use their fireplace a few times a week might be better off with a face cord or a quarter cord. Our two most popular quantities are the 1/4 cord and 1/2 cord. It really depends on how cold it is, and how often you like to sit by the fire! If you are using a wood stove or even a heating your home with a firewood furnace than you could use at least a cord, if not several cords. Firewood is a good thing to supplement the heating of your home if done properly. Very useful if you have a family room with a fireplace where the family can hang out at night and keep warm, while keeping the rest of the house a little cooler (which is better for sleeping). However firewood as a fuel is not all that efficient. Sure, adding glass doors to your fireplace and getting a top notch wood stove helps, but at the end of the day, you're not likely to get firewood to perform better than oil or gas heat. The environment and global climate change is on everyones mind these days. If you're worried about firewood being a major pollutant, not to worry! If you burn firewood efficiently, then you are actually engaging in a carbon neutral event. When a tree grows, it consumes exactly the same amount of carbon that it will give off if you were to burn that fuel. However, I know that you want the details! It was difficult to determine the CO2 produced by a cord of wood since a cord is sold by volume, not weight. Based on a lot of sources, I assumed an average cord weighs 3,500lbs. This is the equivalent to 1.75 short tons. Based on EIA data, burning one short ton of wood emits 3,812lbs of CO2. This would be 6,671lbs of CO2 per cord or 3.02 metric tons. The cost to offset 4.8 metric tons of CO2 is $35.